Had a problem with one of my cars yesterday. My wife, who had been driving the Honda Insight, had previously questioned me about the clutch feel. Dismissing this with a wave of my hand (I figured she’d just been driving the much-heavier-clutch Peugeot diesel too much), I thought no more of it until I got into the Honda and the clutch pedal went straight to the floor. No gear selection was possible, so clearly the clutch was no longer disengaging. Paradoxically, despite the engine’s low absolute torque output, the clutch in the Honda has a hard time. This is because the gearing is so high – to move away from a standstill, the clutch always needs to be slipped. So although it doesn’t have a lot of kilometres on it, the clutch is starting to wear, juddering a little if the take-up is not got exactly right. So when the clutch failed to work at all, I suspected the worse – perhaps the spring fingers had collapsed or something. But the first step was a careful underbonnet inspection. 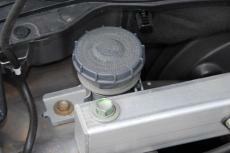 There I discovered that the clutch uses a hydraulic actuation system – and the reservoir was empty! Hmm. I filled the system with Dot 4 brake fluid (as specified) and then bled it. And then – what do you know – the clutch worked again! So where had the fluid gone? There was a slight moistness around the slave cylinder, probably enough of a weep that over time the fluid level could have lowered itself sufficiently to start drawing air. You see, I’d never – not once – checked the level of fluid in the clutch master cylinder reservoir. Not once. Right now – and probably for the next few years – there’s a helluva bargain to be had. I’ve bought one to put on the shelf and I highly recommend that anyone else into useable road performance does so too. And what should you buy? At least one of all those BA and BF Ford Falcon XR6 intercoolers that are being flogged-off on Australian eBay, commonly priced from about fifty bucks. 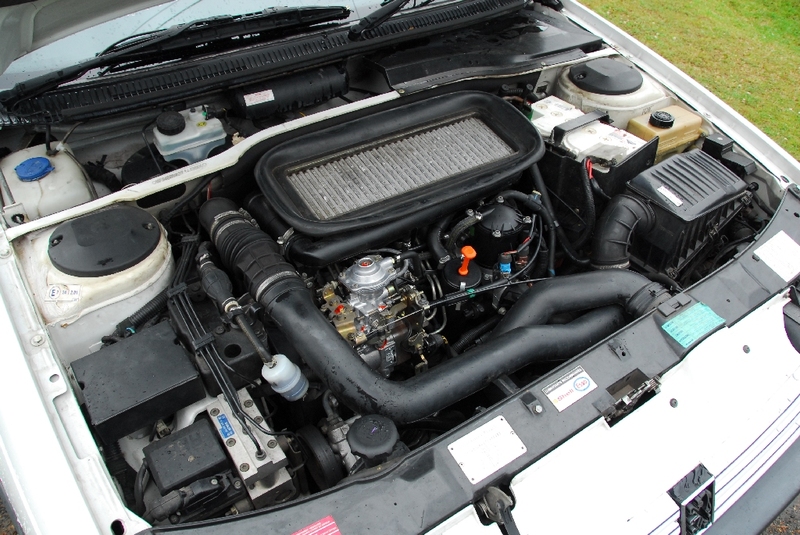 Now maybe the people who want far in excess of the Falcon’s standard 240kW have an urgent need to replace these Garret-cored, bar-and-plate intercoolers with something far better, but for people who are happy to drive a car with performance not limited by wheelspin, these intercoolers look perfect. Being an all-welded design, they’d also be dead-easy to jacket with aluminium sheet, making them water/air intercooler cores. At a core size of 370 x 175 x 60mm, they’re relatively compact but have well-shaped alloy end tanks. For people wondering overall size, they’re 620 x 270 X 60 cm to the extremities. Inlet/outlet tube size is 58mm (hose ID). Even if you consider the time and labour to fold up new end tanks from sheet aluminium and pay someone to TIG them to the original core, you’re still talking an excellent intercooler for the price. The one I bought came with all its hoses and clamps – also very useful when you’re plumbing any intercooler into place. Without having done any flow or temperature testing, but looking at the core and assessing the original application, I’d be happy running at least 200kW through them – more, eg 250kW – with a good water spray. Thanks to all of you; but to especially those who have been reading my material for a long time. By your praise, and by your criticism, and by your demands that I produce the best for you that I can, you have all made me a far better self-taught engineer than I would ever otherwise have become. I know if I write something about (say) how an anti-roll bar works, and I get it wrong, there will immediately be people happy and ready to correct me. Doing this job for nearly ten years has taught me, in a way that I’d not realised before today, that in mechanical things I constantly internally justify what I do and how I am doing it, and that in everything I do I need to cite evidence that it works. And can I also say, you’re equally all responsible for my being today thrown off a discussion group! Over the years I’ve spent a lot of time in TAFE libraries (for those not living in Australia, technical college libraries). In addition to the very valuable automotive books, it’s the engineering papers that are the most interesting. Each year the Society of Automotive Engineers publishes numerous technical papers on all topics automotive. You can buy them as downloadable pdfs by going to www.sae.org – but because you can see only a précis of the paper before you need to get out your credit card, this can be an expensive way of acquiring information. However, technical college libraries often have some of the papers, especially in the book form that the SAE occasionally publishes. The ability to keep on the cutting edge of change is one clear advantage of the SAE engineering papers, but there’s another major advantage that’s often overlooked. And what’s this other advantage? If you own an older car, it’s possible by consulting the papers of that era to find stuff that’s directly relevant to your machine. 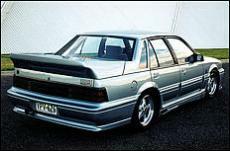 In 1990, when I owned a VL Holden Commodore Turbo, I was frustrated by its lack of aerodynamic development. The standard car was lousy and there were no simple off-the-shelf improvements available. The HDT Brock Commodores had body kits developed with no scientific input, and the pictured groundbreaking ‘Walkinshaw’ Group A, the first HSV model and one shaped with a huge amount of wind tunnel work, was too expensive to buy. (And it didn’t have the turbo engine.) And because the Walky was a near new car, you also couldn’t buy copies of its body kit. As I have often written here, I love buying (and reading too, of course!) car books. I have a very extensive library of automotive books, including many technical examples dating back up to ninety years. Invariably, even when opening a very old book, I learn something. For example, a few months ago I bought a series on automotive engineering published in the late 1920s. I was amazed at the coverage given to steam and electric cars, and that in part triggered the series we ran in AutoSpeed on alternative forms of propulsion. After all, if steam and electric were then so strong in comparison to the internal combustion engine, why not now as well? However, there’s one type of old book which is usually a dead loss. Except, I guess, as a historical curiosity. And the type of book? Those that cover modification, or as it was often called then, ‘tuning’. Even the tuning books seen as classics – and so worth quite a lot of money – are today usually irrelevant. For example, Automobile Engine Tuning (1962) is a book that is usually commands very good secondhand prices. Its author, Phil Irving, was a highly regarded automotive and motorcycle engineer. But open the book today and it’s all so dated that there’s nearly nothing you can use. Before people write defending the man, I’ve no doubt that in its time the information was all useful. But today I couldn’t find a single thing that benefited me. Not one thing. Simply, the use of 4-valve heads, full engine management with closed loop control, variable valve timing – and all the rest – makes the technologies covered in these books pedestrian. Like, they get enormously excited dealing with stuff that was available mainstream 20 years ago. Or, to put it another way, what was then exotic and on the cutting edge is now available in cars so old they’re being sent to the wreckers for a hundred bucks. But there’s another side. If the modification book looks not at hands-on tweaks but instead at the theory behind them, the material dates far less quickly. The superbly named Souping the Stock Engine, published in 1950, has plenty in it as relevant today as when it was published. For example, its Five Paths to Power are: increase piston displacement; increase the weight of the mixture drawn in on the intake stroke; increase the efficiency of combustion; increase the mechanical efficiency; increase the peak rpm. Doesn’t get much more relevant that that, eh? We’ve all heard of short-shifters, where the throw of the gear lever is reduced. 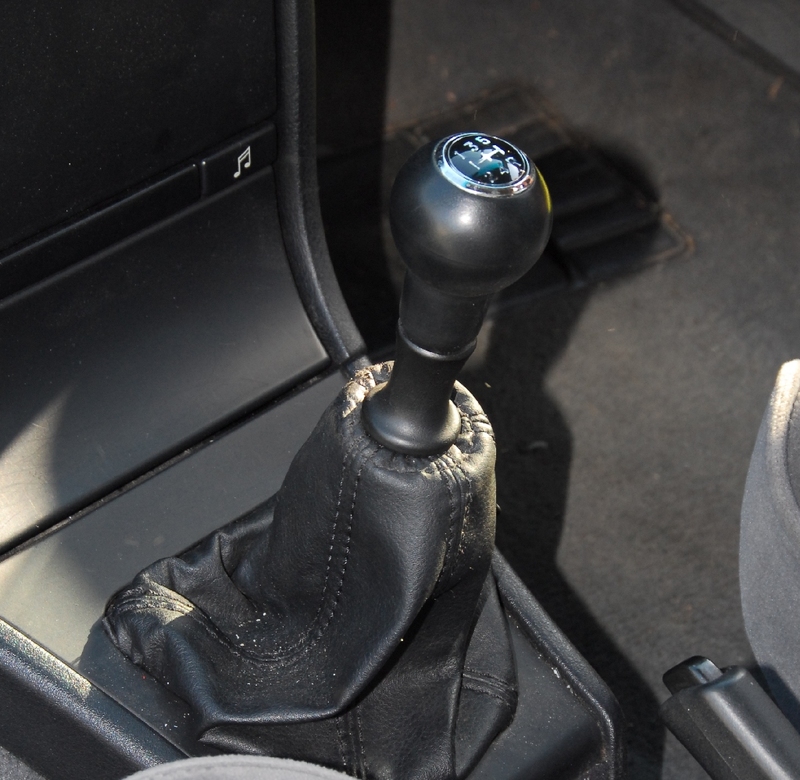 Short-shifters are available aftermarket for many cars and some performance models of mainstream cars use a shorter gear throw. Generally a short-shifter moves the fulcrum point so that less movement is required of the gear-knob to achieve the necessary movement of the selector forks. Some short-shifters provide a movement so abbreviated that the gear lever feels more like a light switch. However, in any gearbox, a shorter throw will require more effort – that is, the gear shift will be heavier. Most enthusiasts agree that a shorter gear throw is attractive, purportedly because quicker shifts can be made. But in the real world, I doubt that’s actually the attraction. Instead, it’s probably because it makes the car feel more responsive and quicker – snick, snick, snick the gear lever on the way up and down the ‘box. I once had a Rover 2000, a very British car with a large steering wheel, low-power 2 litre 4-cylinder – and about the quickest factory shifter you’re ever likely to come across! The movement of the very short gear lever movement was completely at odds with the feel of the rest of the controls. These thoughts all became relevant yesterday when I went off to the wreckers to find a new gear knob for my Peugeot 405 SRDT. The original was cracked and tired and wrecker replacements are so cheap that the upgrade was well worth it. And $5 later, I had a nice, heavy, ex late model Kia gear knob that had the right shift pattern shown on top. The thread wasn’t a match for the odd, vertically splined (except they’re much too crude to be called splines!) Pug gear lever, but I figured I could adapt it. At the wreckers I’d taken off the Pug gear knob, only to have it come to pieces in my hands. So on the trip home, I simply bunged the new gear knob on top of the shaft, so extending it by about 50mm. And you know what? The slower, lighter gear shift that resulted actually felt pretty good! But I was sure that I was confused – how could a slower shift be better? – and left the gear knob in this position for a few days. I also got my wife to drive the car. And we both agreed that the lighter, longer travel gear shift felt better than standard. So, instead of shortening the gear lever and putting the new knob closer to the floor – so resulting in a poor man’s short shift – I went the other way…. installing a “long shift”! Selecting second gear on a down-change is easier and on the up-changes, the synchro seems to like the slower shift. 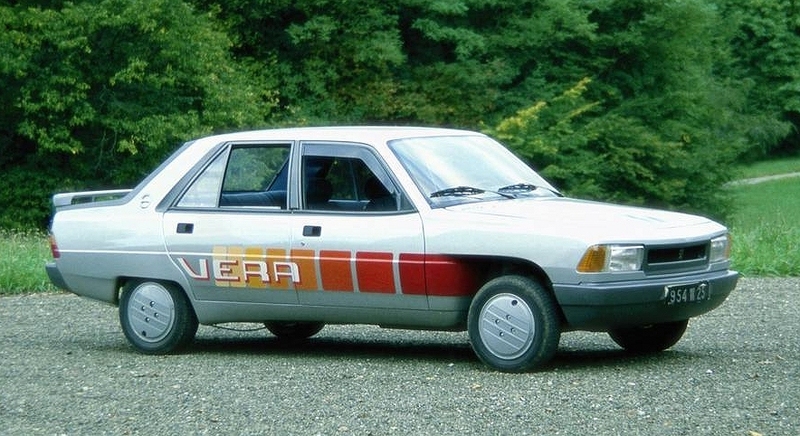 The gear-box, a design with a pretty horrible standard shift quality, is simply much improved…. I’ve written here previously about three wheel cars but recently I came across a very interesting article on the topic. It was first published in US magazine Road and Track in May 1982 and is based around a report prepared for the National Highway Safety Administration by race car engineer Paul Van Valkenburgh. Van Valkenburgh, working for Systems Technology, Inc, was tasked with seeing whether or not 3-wheel cars had intrinsic dynamic deficiencies over 4-wheel cars. As in, do 3-wheleers really have a propensity for overturning, have uniquely (bad!) handling, and so on. He tested eight 3-wheelers, four with a single front wheel and four with a single rear wheel, and he compared them to four roughly equivalent 4-wheelers. The first concern of those who insure, if not those who drive, 3-wheelers is the possibility of turning over. A theoretical dissection of the problem turns out to be less important than simple observation that one test 3-wheeler had better overturn resistance than the best 4-wheeler, a Fiat X1/9. Sound ridiculous? It isn’t if you look at the numbers. If you get the center of gravity (cg) low enough and close enough to the 2-wheel end, and have a wide enough track, you can build a 3-wheeler that won’t overturn in the most extreme maneuvers on flat pavement. Naturally, if you retain the identical cg location and track width of a given 4-wheeler, three wheels will provide a lower overturn safety margin. But these design parameters are never cast in stone and, in limited production, you can put the cg and track just about anywhere you choose. To be honest, the 3-wheeler with the best overturn resistance was sans body, and therefore had an unrealistically low cg. But another 3-wheeler, fully equipped, was still almost as overturn resistant as the Fiat. Also, I should note that one of the 3-wheelers could have been overturned in testing and in fact was by its owner. It had a high, rearward cg and narrow track, and at 0.6g it would take up on two wheels, precisely as predicted from static tests. To a skilled driver, this was no problem, and it could be balanced there like a motorcycle as long as you had enough time, space and presence of mind. But now I come to a philosophical question: Is a vehicle that will overturn during hard cornering “unsafe”? Perhaps it is even more of a legal question, as there are some current lawsuits trying to determine if Jeeps and other recreational vehicles are “unsafe” in overturn. If overturn in cornering is unacceptably dangerous, what about tall, narrow, commercial vehicles, such as loaded tractor-trailers, which can go into oversteer at about 0.3g and overturn at about 0.6g? Even if I assume that engineers of 3-wheel automobiles would optimize the overturn design limits, I still need to know how their stability and handling compare. I will ignore the myriad ways of analyzing stability (static, dynamic, transient, steady-state, oscillatory, divergent, covergent) and just consider oversteer/understeer. Most car enthusiasts have an intuitive feel for these terms and respect for the potential dangers of unexpected oversteer at the limit. As it turns out, there was a strong distinction between 4-wheel cars and single-front-wheel cars — but not single-rear-wheel cars. Although the sample was admittedly small, the inescapable conclusion is that all single-front wheel 3-wheelers will oversteer at their limit of adhesion. Conversely, all single-rear-wheel cars had strong understeer at the limit. And in neither case could the opposite effect be created, in spite of all the chassis tuning. Conventional 4-wheelers have a constantly increasing steer angle as speed or g-forces increase. The same is true (to a potentially greater degree) with single-rear 3-wheelers. But the steering on single-front 3-wheelers levels off and then decreases with increasing g’s, requiring counter-steering to avoid a spin. If these results were difficult to predict, they are easy to explain after the fact. Oversteer/understeer is a result of many vehicle dynamics factors, such as tire size, type and pressure, suspension characteristics, steering compliance, weight distribution and roll resistance distribution. With all other factors being roughly equal, the end of the car with the greatest weight and greatest roll resistance (springs or anti-roll bar) will have the lower limit of adhesion. Put another way, a nose-heavy car or one with lots of its roll resistance up front will understeer, and vice versa for rear/oversteer. The implications are obvious. 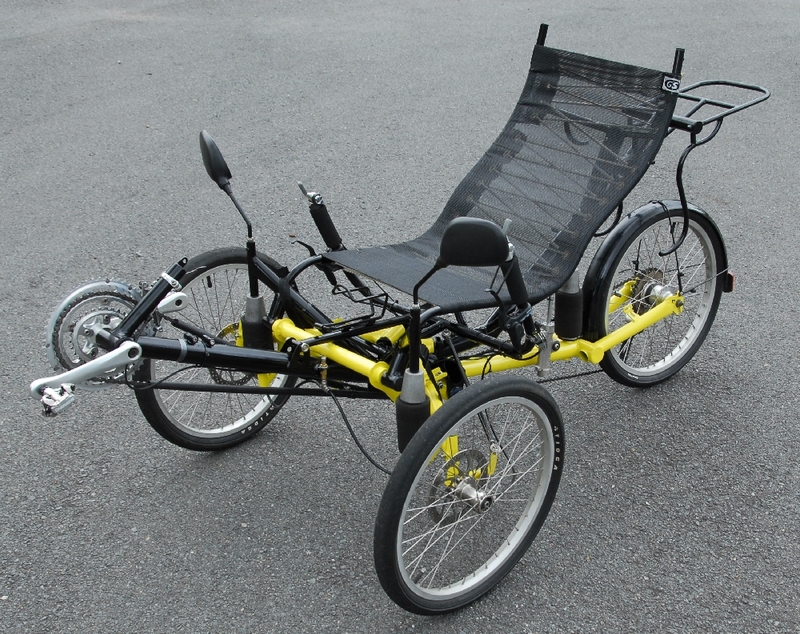 With a single front wheel, most of the weight is at the rear, not to mention all of the roll resistance. 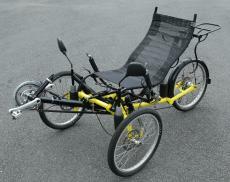 On some of these 3-wheelers, extremes of state-of-the-art chassis tuning tricks were attempted, with negligible effect. Regardless of large tire and pressure differences, camber changes and changes in weight distribution that were reasonable from an overturn standpoint, they still oversteered. But again, is oversteer unacceptable? There are a lot of naive folks driving around out there in oversteering production sedans (because of low tire pressures) who will never encounter that limit even in an emergency. The fact of oversteer is easy to obtain; the implications are more than a little speculative. So overturn can be avoided, and single-rear 3-wheelers have a comfortable degree of understeer. But what about handling — how do they feel? Professional researchers resist being quoted on subjective impressions, but at least here they report a numerical value for handling response. These yaw response times represent the time required for a car to reach a steady cornering condition after a quick steering wheel input. Ordinary 4-wheelers range form perhaps 0.30 seconds for a large car with soft tires, to 0.15 sec for sports cars. All of the 3-wheelers were below 0.20 sec, to as low as 0.10 sec. and that is quick. The answer is not in the number of wheels, or their location, but in mass, tires and polar movement. The effect of polar movement has been considered for years, but this is the first report I have seen with actual figures. The 3-wheelers had, on the average, about 30 percent less polar movement (normalized for weight) than 4-wheelers, because of centralized masses and less overhang. And the ones with the lowest figures and best tires had the quickest response. Van Valkenburgh says that some of the 3-wheelers had yaw characteristics akin to those of formula cars. All of the rest of the tests showed no measurable difference between 3- and 4-wheelers. The testers subjected the cars to crosswinds, bumps in turns, braking in turns, free steering return, lane changes and off-camber turns, and although there were many vehicle-specific problems (as you would expect with one-off prototypes) the number of wheels was unimportant. The technical problems involved in producing a practical 3-wheel car do not appear to be overwhelming. And the potential benefits of cost and fuel conservation would seem to make it worthwhile. As Van Valkenburgh succinctly put it, “a properly engineered 3-wheel car can be made as stable as a properly-engineered 4-wheel car.” But recall your initial reaction to the questions of stability and handling. The big problem is psychological — market acceptance of a radical change. Even if the 3-wheel layout were twice as good, I wouldn’t speculate about its future. One of the most powerful forces on earth is the inertia of an existing idea. But if 3-wheelers ever have a chance to make it, their time is now. Last weekend I attended an electric car show. Organised by the Sydney branch of the Australian Electric Vehicle Association, it was unlike any other car show I’ve ever been to. Well, firstly, the cars were different to 99 per cent of vehicles on the road. 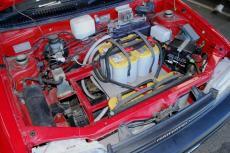 With the exception of a few current model Prius Toyotas, they were all home-converted battery electric vehicles. That’s right, (mostly) road-registered and street driven, these cars never visited petrol stations but instead needed only to be plugged into mains power. Another thing rather different about the show was the interest being shown by visitors. At a typical car sow you’ll get lots of lookers but few talkers. Here, every visitor had dozens of questions – and some even came equipped with notebooks and were writing down the answers. One guy had come all the way from Canberra and was actively seeking the information to enable him to have a car converted to electric power for his daily commute. Others were asking about conversion costs, battery life, range, performance – and everything else you could imagine. There was a constant buzz of interested conversation. Along with the road-registered cars, there was also an electric kart, a half-built electric clubman and an electric motorbike. The road vehicles included a Camry wagon, Daihatsu Charade, Hyundai Excel, Daewoo Lanos and even a Mazda ute. I was attending the show to gather material for some AutoSpeed stories, and got to drive three of the cars. We’ll be running these stories in due course, but in the mean time, if you’re at all interested in building your own battery electric car – or having a car converted to battery electric power – be aware that there’s a bunch of very enthusiastic and helpful people available to you as a resource. Perhaps I am unusual in that as a guy in his mid-forties, I’ve owned relatively few carburetted cars. My first two cars were carby, but after that my main cars have always had electronic injection. And so I’ve got completely used to thinking in terms of cars with plenty of electronics controlling the fuel and ignition. The shock isn’t so much in making changes to the fuel system; it’s in all the other avenues which are no longer viable. For example, the Independent Electronic Boost Control kit worked extremely well when I developed it. But I can’t use it on the Pug because there’s no electronically varying injector pulse width! The Intelligent Turbo Timer is another project that immediately springs to mind – but again I can’t use it because there’s no electronic indication of load. None of these ideas is earth-shattering. But it’s interesting how I need to so dramatically change my mind-set – I guess, just the same as if I went back to modifying a carby car…. If you own – or buy – an Eighties or Nineties car you’ll invariably find it has lots of black plastic exterior bits. Bumpers are the biggest examples but often there’ll also be side protector strips and rear vision mirrors. And nothing looks worse on these cars than when the rich, deep black turns to a friable grey. My Peugeot 405 SRDT is one of the breed with lots of exterior black plastic trim. And, especially against the white paint, the black-that-was-now-grey looked terrible. I tried some exterior trim restorer – a good brand of stuff, quite expensive – and it didn’t fix the problem. (But on another car, with rubber strips rather than plastic, it worked well.) So I went back to the auto parts shop and looked again. 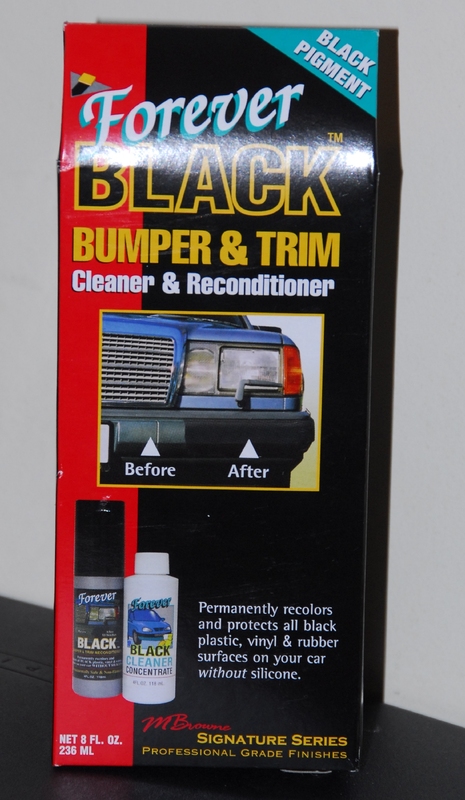 What I came home with is pictured above – Forever Black Bumper and Trim Reconditioner. The on-box blurb says: “Permanently recolors and protects all black plastic, vinyl and rubber surfaces on your car without silicone”. And now, having applied the stuff, that description seems pretty well on the money. Because you see, this liquid is basically a dye! You clean the surface with the provided cleaner (I must say that, having just cleaned the car, I didn’t bother using the cleaner) and then apply the liquid via a foam applicator, a bit like shoe polish. The instructions suggest masking off surfaces you also don’t want black, and I did a combination of this and later using polish to remove the excess that had got past the masking and onto the paint. Grey, faded surfaces turn to a rich black – and if they don’t, you simply put on a second coat. It’s nothing like the other ‘black surface’ restorers I have used – although over the years I’ve tried only a handful so am certainly no expert. The rear bumper of the Peugeot clearly needed less, so perhaps it had been replaced during the life of the car. The front bumper needed two coats. The end result makes the car look vastly better, not just in that it looks less tired, but also in that the original designers’ intentions are now much clearer – the body visually ties together better.